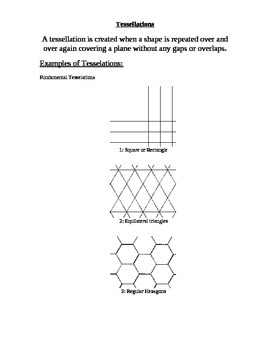 Here is a word document with notes and picture example of what a tessellation is. Students like the pictures and it helps for them to see what they are. 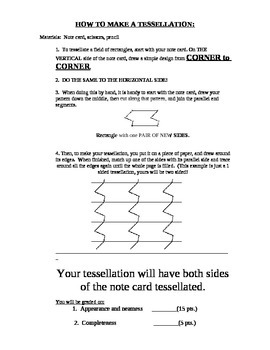 There are also directions for students to make their own tessellation on a note card. I will normally give them a big white construction paper to draw their tessellation on and then they have to color the entire paper. It can be basic or as detailed as they would like. 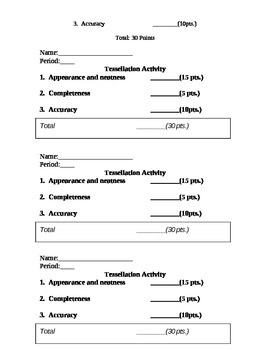 There is also a grading rubric I use to grade the tessellation.